The Department of Journalism and Corporate Communication hosted several alumni as part of a interactive mentorship forum on February 28 at the auditorium. The event, which attracted over 60 undergraduate journalism majors provided an opportunity for students to interact with such household alumni as Africa Uncensored CEO Mr. John-Allan Namu (Journalism, 2006), Open Capital Advisors Group Communications Manager Ms. Corazon Wandimi (Journalism, 2009), freelance videographer Austin Otieno (Journalism, 2017) and Nation Media Group Reporter Brian Wasuna (Journalism, 2012). Others present were adjunct faculty and alumni Mr. Daniel Omondi and Mr. Fred Waga. Vice Chancellor Prof. Paul Zeleza who was the chief guest, emphasized the need to expand cinematics, film, and creative arts sectors which are critical areas in the creative economy, given that it accounts for 5.32% of Kenya’s GDP. He also reiterated the University’s commitment to supporting the growth of the new School of Communication, Cinematics and Creative Arts, whose launch will take place in the summer semester. Notable among remarks by alumni was the importance of bridging theory and practice where students upon graduation are able to apply the knowledge and skills they have gained in classroom. They also emphasized the centrality of mentorship programs in nurturing and inspiring the current students as they prepare to join the competitive job market. Faculty members led by the Department’s Chair Dr. Kioko Ireri (Associate Professor of Journalism and Mass Communication) underscored the importance of collaboration among the alumni, faculty, staff and students, to achieve a common agenda of providing mentorship and academic enrichment to learners. Further, they encouraged students to take advantage of the mentorship programs in order to shape their career paths. The event was organized by the Students Advising and Mentorship Committee chaired by Dr. Joseph Nyanoti, and whose membership includes Ms. Robi Koki (Lecturer, Journalism), Mr. Silvester Mutua (Lecturer, Journalism), Dr. Geoffrey Serede (Assistant Professor of Journalism), Dr. Lucy Gichaga (Assistant Professor of Journalism), Mr. Isaiah Cherutich (Lecturer, Journalism & Public Relations) and finally Chair of the Department of Cinematics Arts and Assistant Professor of Film & Animation Dr. Rachael Diang’a. 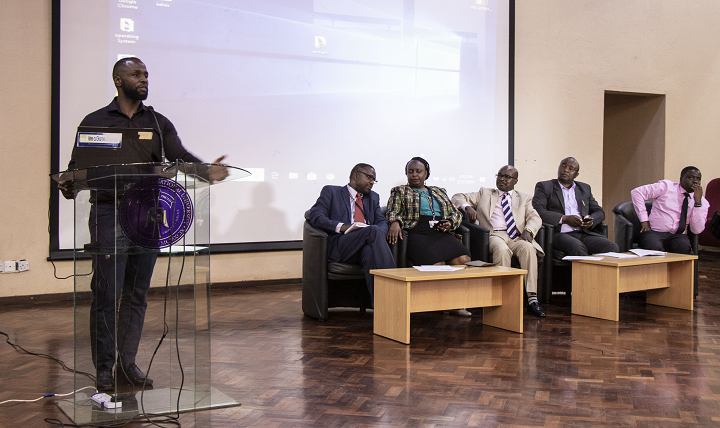 Dr. Stephen Kimotho (Assistant Professor of Journalism), Dr. Gichaga, Mr. Mutua, and Dr. Serede also attended the event, which the department hopes will henceforth be held every semester.